As agreed by all relevant parties, Premier Li Keqiang of the State Council will hold the third Round Table Dialogue in Beijing on November 6 with President of the World Bank Group Jim Yong Kim, Managing Director of the International Monetary Fund Christine Lagarde, Director-General of the World Trade Organization Roberto Azevedo, Secretary-General of the Organization for Economic Cooperation and Development Angel Gurria, Chairman of the Financial Stability Board Mark Carney and Deputy Director-General of the International Labor Organization Deborah Greenfield. 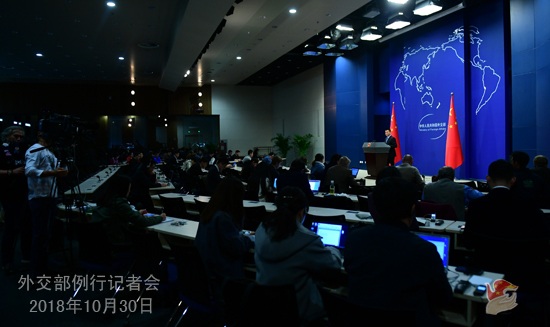 They will hold discussions on the global economic trends, the preservation of the multilateral trading system, China's economy and reform and opening up and other topics. Q: According to reports, the Australian state of Victoria reached an agreement with China on the Belt and Road Initiative, becoming the first Australian state to support the initiative in an official way. What's your comment? A: China commends the choice made by the government of the Australian state of Victoria to take an active part in building the Belt and Road Initiative. The government of the Victoria state has seized the opportunity to deepen practical cooperation with the Chinese side, which will surely bring more opportunities and benefits to the local communities. We have full confidence in the broad prospects our mutually beneficial cooperation enjoys under new circumstances. Q: The China-ASEAN Military Exercise-2018 was officially concluded. How do you comment on China holding the first kind of this joint drill with ASEAN? A: As for the China-ASEAN Maritime Exercise-2018, the relevant information has already been released. As agreed by the leaders of the defense departments of China and ASEAN countries, the China-ASEAN Maritime Exercise-2018 was held in Zhanjiang, Guangdong and in the airspace and waters east of Zhanjiang on October 22 to 28. More than 1,200 officers and soldiers from China and ten ASEAN countries joined the exercise. All participants spoke highly of the exercise and look forward to more maritime practical cooperation between China and ASEAN in the future. This exercise was the first joint drill by China and ASEAN. It was also the first joint drill that ASEAN held with another single country. This testifies to the fact that China-ASEAN strategic coordination has reached a new level and meaningful defense and security cooperation has achieved new outcomes. The basis for practical cooperation between all countries has been consolidated and a new starting point has been set for China and ASEAN countries in the joint efforts to address security threats and uphold regional peace and stability. The joint military exercise was held as China and ASEAN mark the 15th anniversary of the establishment of strategic partnership. China would like to work with ASEAN countries to enhance mutual trust, expand cooperation, and elevate China-ASEAN relations to a new level. Q: The Trump administration yesterday put restrictions on a Chinese semiconductor company called Fujian Jinhua, banning it from buying any products in the United States. What is your comment on this? A: I have noted relevant reports. I want to stress that the Chinese government always asks the Chinese enterprises to observe market rules and local laws and regulations when carrying out investment and cooperation overseas. We also ask foreign governments to accord equal and reasonable treatments to Chinese enterprises and offer a sound investment and cooperation environment for Chinese enterprises operating in their countries and regions. We hope that the US could do more to enhance mutual trust and cooperation with China, instead of doing the opposite. As for your specific issue, the Commerce Ministry which is the competent authority on this issue will make clear its position. You may keep following that. Q: According to reports, the central banks of China and Japan have signed a bilateral currency swap deal during Japanese Prime Minister Shinzo Abe's visit to China. Do you have more information on that? A: During Prime Minister Shinzo Abe's visit to China, the two countries signed a dozen of inter-governmental agreements, including a bilateral currency swap agreement inked by the People's Bank of China and the Bank of Japan on October 26. The deal is worth 200 billion RMB and valid for three years, which is renewable upon mutual consent, as you may already know from the media reports. This agreement is designed to maintain the financial stability of the two countries and boost bilateral economic and financial activities. Just as the two state leaders pointed out, under the new circumstances, China and Japan need to conduct practical cooperation at a higher level to fully unleash cooperation potentials. The Chinese side stands ready to work with the Japanese side to implement the consensus of the two leaders to expand fiscal, financial and other mutually beneficial practical cooperation and deepen China-Japan economic relations. Q: Yesterday you announced Cuban President of the Council of State Díaz-Canel's upcoming visit to China. Can you give us more information on this visit? Is he going to hold talks with Chinese President Xi Jinping? A: I already talked about his visit yesterday. China welcomes President Díaz-Canel's visit to China. According to what I have at hand at this point, during the visit, President Xi Jinping will hold talks with President Díaz-Canel, and other Chinese leaders will meet with him separately. In addition, President Díaz-Canel will also attend the first China International Import Expo in Shanghai. Cuba is the first country in Latin America and the Caribbean to establish diplomatic relations with the People's Republic of China. The China-Cuba relationship enjoys a solid foundation, rich dimensions and great vitality, which is running at a high standard and continuously making new progress. China attaches high importance to China-Cuba relations and stands ready to maintain close high-level interactions and enhance across-the-board exchanges and cooperation with Cuba. We believe that President Díaz-Canel's visit will further consolidate and strengthen the traditional friendship between China and Cuba and promote new progress in bilateral ties under new historical conditions. Q: Yesterday, Australia's intelligence agency warned about the security risks of using Chinese technologies such as 5G from China Telecoms. Do you have any comment on that? A: We have noted relevant reports. The Chinese government always encourages the Chinese enterprises to observe international rules and local laws when carrying out economic cooperation overseas. Cooperation between Chinese and Australian enterprises is to realize mutual benefit and win-win outcomes. The Australian side should facilitate such cooperation between the two sides, instead of finding all kinds of excuses to obstruct cooperation and taking discriminatory measures. We urge the Australian side to discard its ideological bias and offer a level playing field for Chinese enterprises to compete in Australia. We hope that the Australian side could approach this issue prudently. Q: According to reports, US Secretary of State Mike Pompeo accused China of engaging in "predatory economic activity" in Latin America during his visits to Panama and Mexico. We noted that in an interview with local media later on, Antigua and Barbuda Prime Minister Gaston Browne said the US was just sowing discord and should be ashamed of its policies and actions in the region. He added that the Caribbean region would not have enjoyed such a bright prospect for development if there were no assistance from China. What's your comment? A: I noted those reports about what the US side said. I also took note of the remarks by Prime Minister Gaston Browne and the Antigua and Barbuda media's comments that they hope the US will provide tangible assistance to countries in the Caribbean as China has done. It is not the first time that the US was given a stark reminder by relevant developing countries immediately after it tried to disintegrate solidarity and cooperation between China and other developing countries by spreading false stories. When taking similar questions before, I once said that the public can always tell the right from the wrong. I would like to add something today. If the US could truly care for the needs of the developing countries and offer some real help with no political strings attached, as developing countries wish them to do, then it will also hear more praises and receive less cautions. Q: Bloomberg reported earlier today that the US may announce by early December tariffs on all remaining Chinese imports if talks next month between President Trump and President Xi Jinping make no progress. Can I ask for your reaction to that and how China would be likely to respond? A: China and the US are indeed in communication on the meeting of the two leaders during the G20 Summit in Buenos Aires. 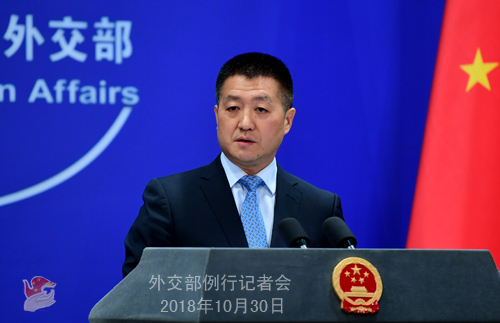 As for additional tariffs on China by the US, I want to reiterate that if the US truly wants to resolve the economic and trade issues with China, then it should adopt a serious attitude and have equal-footed talks with us in good faith, instead of letting out this or that kind of remarks every now and then to try to intimidate China, because no intimidation will work on us. The economic and trade relationship between China and the US is for mutual benefit and win-win results in its nature. Such a relationship has brought tangible benefits to the business communities and consumers on the two sides over many years. If the other side does not want to maintain or expand such cooperation on the basis of equality and mutual benefit, then China is fully confident in walking steadily on our own path of development and adhering to our basic state policy of reform and opening-up. Q: Recently, after Canada legalized the use of marijuana for recreational use, the Chinese Consulate General in Canada issued a warning to Chinese citizens not to buy any of those substances. Can you tell us what was said in the warning? Secondly, environmental groups have warned that China's reputation will suffer because of the decision to allow trade in tiger bones and rhino horns. Do you have any comment on that? A: I need to check on your first question. On your second question, we have checked the situation with the State Forestry and Grassland Administration. I can give you some information on that. It is China's consistent position to strengthen protection for rhinos and tigers and all other endangered species in accordance with law. The State Council of China published a notice in 1993 on strictly controlling sales and usages of rhinos, tigers and their derived products. But part of that notice conflicts with existing law and fails to accommodate the practical and reasonable needs of scientific research, education, law enforcement and appraisal, medical healing and cultural relics protection and exchanges. Besides, it lacks specified and strict regulations on other rhino and tiger products except for rhino horns and tiger bones, thus leaving loopholes for cracking down on bad behaviors like eating tiger meat and manufacturing and selling tiger skin-made clothes. In response to these problems, China adjusted its policies while upholding the legal principle of "protection first, standard use, and strict supervision". The adjustment has taken into account the pros and cons it may have on the global cause of protecting rhinos and tigers. It strictly specifies the special circumstances under which relevant permits will be granted, formulates a series of strict regulation measures, and improves inter-agency coordination mechanism on law enforcement. This will strengthen law enforcement effectiveness, raise the awareness of the public to resist illegal behaviors, and contribute to the global endeavor to protect rhinos and tigers. We have noted the concerns made by relevant parties of the international community. We would like to have adequate communication and exchanges with them to improve mutual understanding. Q: The wife of the former Interpol President Meng Hongwei issued a statement yesterday, saying that she has retained the services of two international lawyers to try to seek answers from the Chinese government about where he is. Has the Chinese government already been contacted by these lawyers? If so, what has the Chinese government told them? Can you give us any information on where Meng Hongwei currently is? A: I already briefed you on that. Meng Hongwei took bribes and is suspected of violating the law. He is now being investigated by the National Supervisory Commission. Regarding the allegation by Meng Hongwei's wife that his present whereabouts is unknown, I could tell you responsibly that China safeguards the legal rights of all its citizens in accordance with the law, regardless of their current status. The relevant department has told Meng Hongwei's wife that if she wants to contact him by telephone, that can be arranged at any time. But she on the one hand says she doesn't know where he is, and on the other hand refuses to contact him by telephone. You may need to ask herself for why is that.